The pickup: I’d been crunching on apples for snacks and slicing crisp pears atop my salads for weeks before quinces — a relative of both apples and pears — caught my eye at a farmers' market. I’d only ever tasted quince in membrillo, the classic Spanish paste typically served with Manchego cheese. Membrillo is delicious, but it's hard to comprehend how that thick pink preserve comes out of such large, hard, odd-shaped, fuzzy fruits. So I bought three quinces and brought them home, determined to make something different. 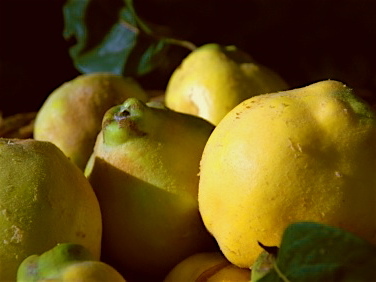 The results: My choices were limited by the fact that quince is too dry, too tart, and too tough to eat raw. So I turned toward baked dishes. Inspired by an old recipe from Sunset magazine, I decided to substitute quince for half of the apples in my favorite version of apple crisp. First, the quince and apples had to be peeled, cored, and sliced. This was an easy task with the apples, but the thick-skinned, hard-cored quinces proved more challenging and time-consuming. Fortunately, the fruits emitted a lovely floral perfume when cut that made the task a bit more bearable. When the prep work was finally complete, I filled a shallow baking dish with the quince and apple slices and began working on the crust. My preferred version of apple crisp is crumbly and thick, and incorporates a secret ingredient: graham crackers. The addition of the crackers creates a lovely golden shell for the fruit beneath, and it pairs perfectly with vanilla ice cream.